Peter Dejans (*1964) studied at the Royal Conservatory of Brussels and the Lemmens Institute in Leuven under Erik Van Nevel. He also took master classes under Frieder Bernius. Since 1996 he has served as Director of the Orpheus Institute (Ghent), which organises postgraduate studies as well as a doctoral programme for musicians. 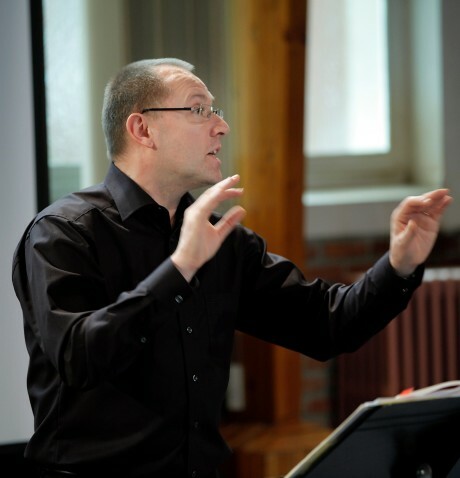 During his studies in Law at the University of Leuven (KU Leuven), Peter Dejans conducted the Leuven University Choir (LUK) and in 1989 he founded the chamber choir Musa Horti. From 1995 until 1997 he conducted the Cappella Antwerpen and in 1998 he co-founded the KU Leuven staff choir, Capella Academica. From 1999 until 2009, he conducted the Cappella Concinite. Peter Dejans is regularly invited as guest conductor of the Flemish Radio Choir (VRK).